Northwestern University Press, 9780810138131, 272pp. From well-known intellectuals such as Frederick Douglass and Nella Larsen to often-obscured thinkers such as Amina Baraka and Bernardo Ruiz Suárez, black theorists across the globe have engaged in sustained efforts to create insurgent and resilient forms of thought. New Perspectives on the Black Intellectual Tradition is a collection of twelve essays that explores these and other theorists and their contributions to diverse strains of political, social, and cultural thought. The book examines four central themes within the black intellectual tradition: black internationalism, religion and spirituality, racial politics and struggles for social justice, and black radicalism. The essays identify the emergence of black thought within multiple communities internationally, analyze how black thinkers shaped and were shaped by the historical moment in which they lived, interrogate the ways in which activists and intellectuals connected their theoretical frameworks across time and space, and assess how these strains of thought bolstered black consciousness and resistance worldwide. 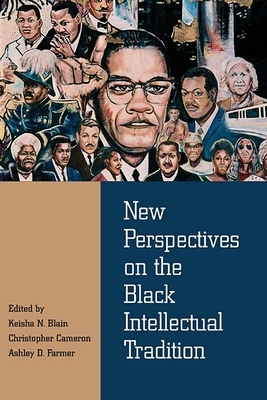 Defying traditional temporal and geographical boundaries, New Perspectives on the Black Intellectual Tradition illuminates the origins of and conduits for black ideas, redefines the relationship between black thought and social action, and challenges long-held assumptions about black perspectives on religion, race, and radicalism. The intellectuals profiled in the volume reshape and redefine the contours and boundaries of black thought, further illuminating the depth and diversity of the black intellectual tradition. KEISHA N. BLAIN teaches history at the University of Pittsburgh. She is author of Set the World on Fire: Black Nationalist Women and the Global Struggle for Freedom and coeditor of Charleston Syllabus: Readings on Race, Racism, and Racial Violence. CHRISTOPHER CAMERON is an associate professor of history at the University of North Carolina at Charlotte. He is author of To Plead Our Own Cause: African Americans in Massachusetts and the Making of the Antislavery Movement. ASHLEY D. FARMER is an assistant professor of history and African and African diaspora studies at the University of Texas at Austin. She is author of Remaking Black Power: How Black Women Transformed an Era, the first comprehensive study of black women’s intellectual production and activism in the Black Power era.